One of our ELSA Group members was looking for some scenarios. 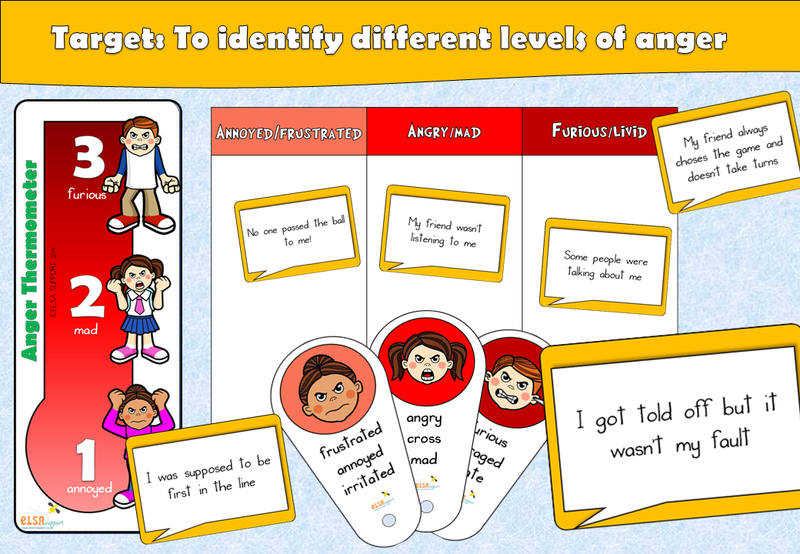 The main purpose was for the child to identify different levels of anger. So for example, some things might annoy you, some things make you mad and some things make you furious. I chose just those three to make it as simple as possible. The members of the group came up with all these real life scenarios which I have put together as cards. I also included a sorting sheet. Obviously what makes one child mad might be just annoying for another child. What makes one child furious might make another child mad. You need to go through the scenarios with the child and find out their levels of anger. Each child would be unique in how they would react to each situation. Target would be – To identify different levels of anger (seems to be a lot of discussion at the moment about setting targets for your work). I thought I would help out where I could and give you a target for each activity I add. Thank you so much. I couldn’t do my job without all your helpful resources and ideas. Please keep posting! I love these, could they be adapted for ‘upset’ ?